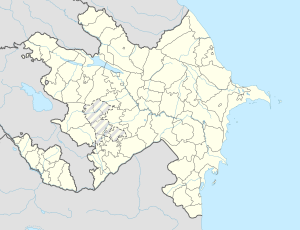 Lachin (Azerbaijani: Laçın, Armenie: Բերդձոր Berddzor, Kurdish: Laçîn; an aw Abdallyar, Datschin) is a toun in Azerbaijan an the regional centre o the Lachin Rayon. Syne 1992 the aurie haes been unner the control o the de facto unthirld unrecognizit Nagorno-Karabakh Republic, which haes renamit the toun Berdzor. The toun an its surroondin region serve as the strategic Lachin corridor connectin the Nagorno-Karabakh Republic wi Armenie. Wi aboot 1,700 indwallers in 2009 (doun frae 2,300 in 2005), population nummers are still declinin despite a proactive dounset policy bi the authorities. ↑ Holding, Nicholas (2006). Armenia with Nagorno Karabagh, 2nd: The Bradt Travel Guide. Guilford, Connecticut: Globe Pequot Press, p. 208. ISBN 1-84162-163-3. 1 Claimit bi the Nagorno-Karabakh Republic but unner Azerbaijani control. 2 Claimit bi the Nagorno Karabakh Republic as the caipital o the province o Shahumyan. This page wis last eeditit on 10 Mairch 2018, at 23:39.